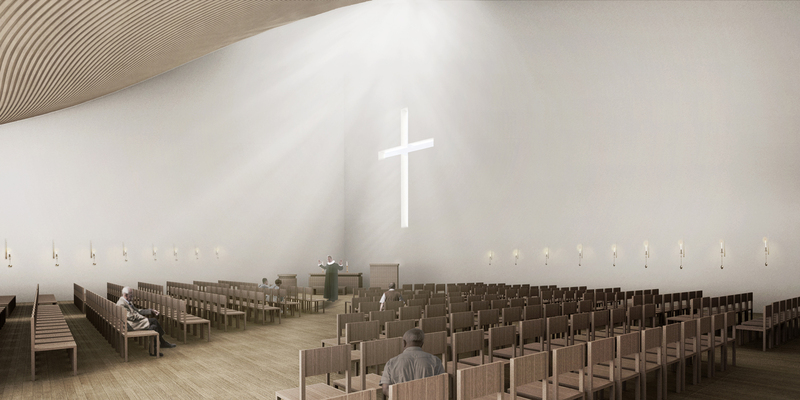 The concept behind our competition proposal for the new church in Sydhavn was directed by a desire to create an open church for everyone, one which provides space for religious purposes as well as being a cultural gathering point; a church which encourages use both inside and out, day and night, all year round. The multiplicity of functions that the church provides is enabled by the architectural design and composition of the building. The ground floor serves as an open space with glazed facades which face out onto the street, inviting visitors and passers-by into the building where gatherings can take place and cultural experiences shared. Above this space, the church room is located on the first floor under the building’s high sculptural roof. These two spaces are connected via a sweeping spiral staircase. The church’s roof – the building’s fifth facade – is carved into a large stairwell which steps down at one corner to the street level, catching the course of the street, allowing pedestrians to move upward and onto the roof. 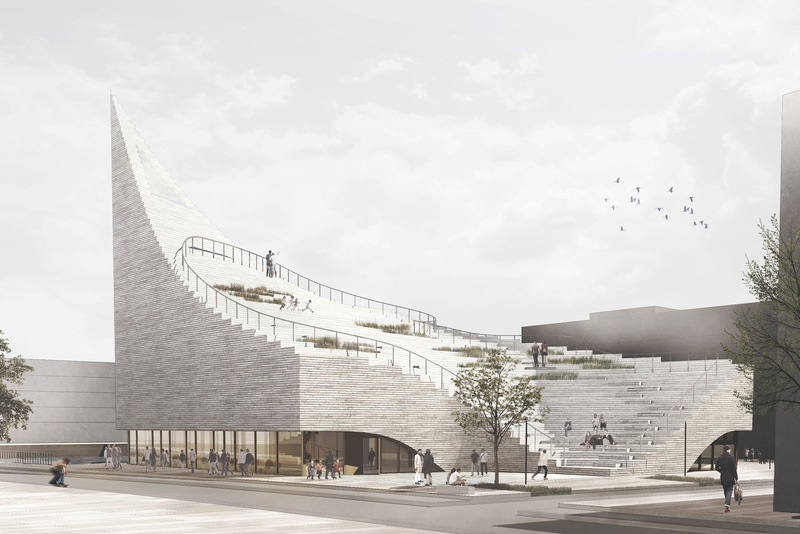 The roof becomes a new publicly accessible urban space, carefully orientated for optimum sunlight, with an amazing view out over the local neighbourhood, the harbour and Copenhagen, and endless possibilities for activities and events. The church room is conceived as a simple, religious space under a great arched ceiling. Daylight pours into the space through a large skylight set high in the roof, as well as through the cross in the wall above the altar. The curve of the ceiling is defined by the desire to obtain ideal acoustic conditions in the room, thus the architectural and aesthetic identity of the building is forged together with producing optimal functionality. At the ground floor level, the cultural space is the natural focal point for the church, and this becomes an inherent continuation of the city – containing a large flexible space for events, exhibitions, a café and much more. Parts of the glass facade can be opened, so that the spaces become part of the surrounding city, drawing the life from the street inside the church. The result is a building which, inside and out, can accommodate formal and informal cultural meetings, social gatherings and activities. A building which combines religious, social, cultural, outer and inner spaces with a strong architectural identity and a sense of calm and enlightenment.